Why look to natural enemies for sustainable Pear IPM? With evolving resistance to pear chemistries and the loss of some chemistries on the horizon there is increasing interest in how we can optimize the work natural enemies do in our orchards. Past projects have supported beneficials and reduced pests before. For example, in the Wenatchee Valley Pear IPM project, natural enemies were far higher in the soft blocks; the principal ones found were Deraeocoris brevis, Campylomma verbasci, lacewings, earwigs and Trechnites sp. Pear psylla populations were higher in the soft blocks in the first year, but declined in subsequent years to levels similar to the conventional blocks. Fruit marking was higher in the first year in the soft blocks due to pear psylla, but damage levels were similar in later years. Since these projects were completed in the 90s pear chemistries have changed and it is time to take another look. Who are the Key Natural Enemies in Washington Pear Orchards? Deraeocoris brevis piceatus is an abundant predator found in Pacific Northwest apple and pear orchards. They overwinter as adults and have multiple generations per year. Deraeocoris tends to emerge from winter quarters in March. For more information. 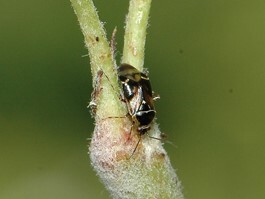 Anthocoris spp are particularly well adapted for feeding on pear psylla and can play a major role in the biological control of this pest. Anthocorids overwinter as adults (multiple habitats). They have multiple generations per year and tend to be active very early. They have a strong preference for psyllids. They are common outside of orchards and have a strong preference for trees and shrubs such as willow, alder, poplar, bitterbrush (Horton 2017). For more information. Campylomma verbasci (Miridae; mullein bug) Generally thought of as a pest in apple, campylomma is an omnivore that also consumes large amounts of pests in pear orchards including aphids, psylla and other soft-bodied arthropods. It overwinters in an egg stage (i.e., in apple wood) and has multiple generations per year. It is common outside of orchards in herbaceous plants (i.e., mullein) and woody plants. Adult brown lacewing. Photo E. Beers, WSU. 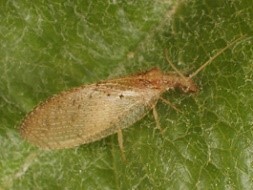 Brown lacewings (Hemerobius spp.) Brown lacewings are an important predator of aphids, psylla and mites and can become abundant where soft IPM programs are used. They overwinter in a mix of stages and have multiple generations per year. They are among the earliest of our predators. For more information. Green lacewings (Chrysoperla carnea, Chrysopa nigricornis) Green lacewings are good predators of aphids and to some extent psyllids. They overwinter as adults. They are fairly early to emerge post-winter with larvae present from late June to early September. They are common outside of orchards on many plants both woody and herbaceous. Often thought of as a pest, the European earwig is an important predator in pear and apple orchards feeding on aphids, pear psylla, mites and insect eggs. When are natural enemies in the field? Dr. David Horton, USDA ARS has recently done extensive work tracking natural enemies in orchards. The figure below shows a summary of when adults and immatures were available in a number of orchards tracked. The result is like a relay where different natural enemies are more prevalent at different points of the season. 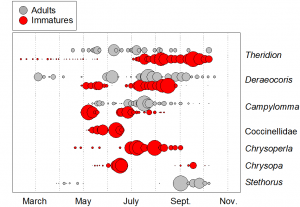 Timing of natural enemies in orchards. The larger the circle the larger number present during this time period. Courtesy D. Horton, USDA-ARS.